Provide total cooling comfort in a simple and elegant way yet preserving our ecosystem. Four different directions of air discharge provide you a 360 degree comfort cooling environment. Combining the power distribution and slim elegant panel; peace, comfort and style are unified together to ensure a state of serenity. Equipped with the advanced PLUSMA technology that can deodorize, sterilize and purify the air promotes a healthy lifestyle. 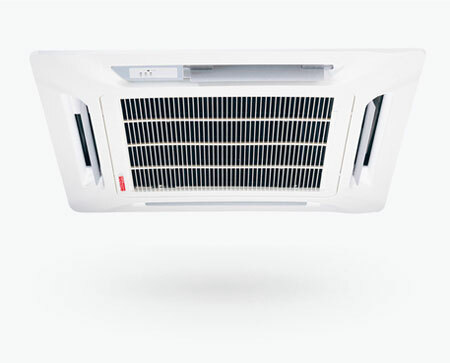 Discharge air in four different directions to distribute and circulate cool air evenly for superb comfort. Each unit comes with a high-performance pump with 700mm drain head to ensure smooth and efficiency drainage of condensate water. Our stylish and slim panel blends in seamlessly to keep your interior design classy. Antifungal filter traps dust particles in the air and allows for easy cleaning - just rinse with water and use it over and over again! A compact, modern look that is in tune with nature. The R410A Ceiling Cassette F Series is stylish with an eco-friendly heart. With efficient, ozone-friendly R410A refrigerant, it is the answer to enjoying cooling comfort without forsaking the environment.